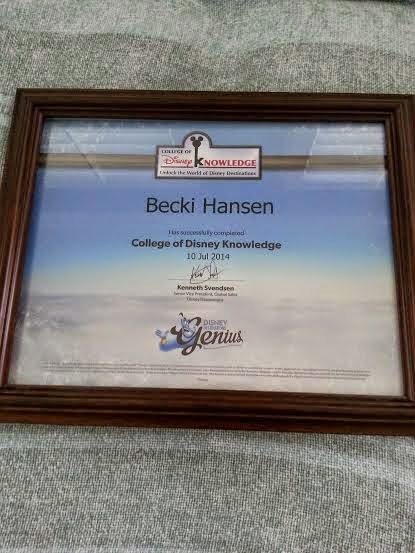 As a recent graduate of the College of Disney Knowledge I have now become a part of an elite group of travel industry professionals who have attained a special knowledge of the Disneyland Resort, Walt Disney World Resort, Disney Cruise Line, Adventures by Disney and Aulani, A Disney Resort & Spa. This was a fun and informative way to learn more about the Disney vacation portfolio. I feel more confident about selling Disney destinations. The College of Disney Knowledge has taught me how to add more value to each Disney itinerary so that I can help make every client's magical dreams come true. Contact me for helping you plan your next Disney vacation! Call Becki @336-922-1837.